It's no secret that we absolutely love Super Mario Odyssey, and one of the things we love most is just how many teeny-tiny details can be found throughout, whatever their form. One of these is what could be classified as an easter egg that occurs when you jump repeatedly on the Odyssey's globe. Doing so will play a music box version of Jump Up, Super Star, or the Fossil Falls theme depending on which Kingdom you're in. If you want to hear it for yourself make sure you check out the video above to do just that. Found that out by accident! Image also is somewhat spoilerish for people who did not know Mario got a chef outfit. I just want to save by going to sleep in Hotel Mario. I have watched from Youtube accidentally. @Kalmaro Jesus Christ, it was shown off during the SECOND trailer for the game. Is there anything someone out there DOESN'T consider a spoiler? @AlexOlney True! It is in the trailers I believe. Have you considered though that not everyone watched the trailers or got a physical copy? @Kalmaro If someone is so sensitive over such minor aspects that Nintendo themselves have officially revealed then the responsibility is with them and not the media outlets. How are we supposed to report on developments whilst pussyfooting around every possible detail? I don't watch trailers for games I know I'm interested in to avoid spoilers. Not too bothered about seeing this chef outfit but can understand why people might be, there was another article with a thumbnail of an outfit I'd rather not have seen. Why not use a generic logo as the thumbnail for an article about a new game many people won't have played/finished yet so people can decide if they want to click in or not? 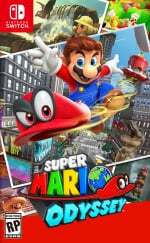 I'm not getting Odyssey until Christmas and I doubt I'm the only one. I found this out by accident the other night, pretty cool I thought. @AlexOlney I see your point, Nintendo did reveal the outfit before so anyone even got the game. However, that is still revealing information to people who haven't seen the game yet or trailers. Would it be okay to just use different thumbnails that just have generic images? Could even just take a pic yourself with Mario in a regular outfit. Let me just say that this is not a criticism on you, and I know you like getting fun info out to everyone without spoiling anything . I figured this might be a way you can do both! @Kalmaro Welcome to the new Nintendo Life, where all thumbnails are just a picture of my living room wall to avoid spoilers and no one can tell them apart at a glance. Spoiler alert: A new Mario game has been released recently. @AlexOlney Dang it, I didn't want to be spoiled that a new Super Mario game came out. Even though I bought and have played it. @AlexOlney Was there something I sad that was wrong? I'm not suggesting you don't show any game footage ever. For instance, the only issue with the thumbnail I found was the chef outfit. With something like that one could just do the same screenshot but with Mario in his normal clothes and things would be fine, right? If you think a outfit is a spoiler, then surely any picture is a spoiler. The culture of shouting spoiler is getting insane. A spoiler I was hoping for tough can't wait to see it myself!!!! @Hughesy Yes, an outfit is a spoiler. The point is to discover outfits and such and you take that away by showing images of them. Which is why I suggested just showing Mario in a neutral one like his basic clothes or just use an image from another game. Like how they have the Mario behind bars pic they use often. There is a far more "dangerous" spoiler in there, didn't you notice it???? I found this by accident and it actually put my kid to sleep. @AlexOlney Any chance we can avoid using Jesus' name as an exclamation? I know you're frustrated, and I def don't think an outfit is spoiler enough to warrant warning. But it's offensive to use Jesus name that way to a lot of us! keep up the great vids though! @Kalmaro These outfits don't do anything in regards to gameplay, not really a spoiler what nonsense costumes you can just wear. You don't even search for it, just appears at the store when you get to that level. @MarinaKat I have to disagree, you need certain outfits to get moons and they change how Mario interacts with the environment. There's also something else they do but I won't spoil it. @Kalmaro That doesn't that defeat your point right there. You say there are those two things to do with those costumes and merely showing there is a chef costume in a picture does not spoil to me where and how to use them or the rewards. @MarinaKat You only said outfits do nothing to gameplay, which is not true, they have a purpose. If you would have said that showing these outfits would not have affected gameplay I still would have pointed out that doing so robs people of being able to discover it on their own. @Kalmaro I think it's just a minor spoiler and there's no need for anyone to get so worked up about it. Don't mind Alex, your comment clearly struck a nerve. Did this once for fun, didn't really think anything of it. Since I didn't know what the song was. @Kalmaro Whether or not you buy the game in digital or retail form, the large game icon when you launch Odyssey on the Switch reveals 3 costumes on the picture (eeek, spoiler alert), one of them being the chef costume. @Honelith Really? I never noticed that. I just kinda mash the a button, I never looked at the icon.